The Green Man is part of our figural myth, our legend--the guardian of the wild places, the Green Knight. Whether he is Puckish, Pan-like, are horned like Cernunnos, the idea of the Green Man stays with us. His image appears in churched, cathedrals and gardens all over Europe and America. 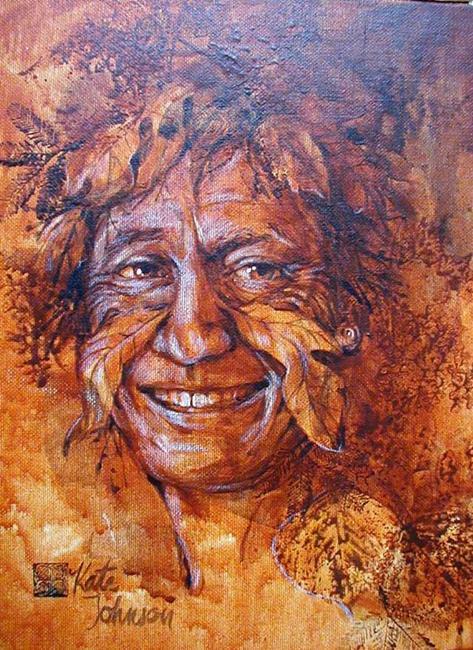 I used a classical technique of a toned ground on canvas, from which I drew the foliate face of the smiling green man with dark colored pencil, inck, and paint, adding highlights that make it pop from the flat surface of the canvas.